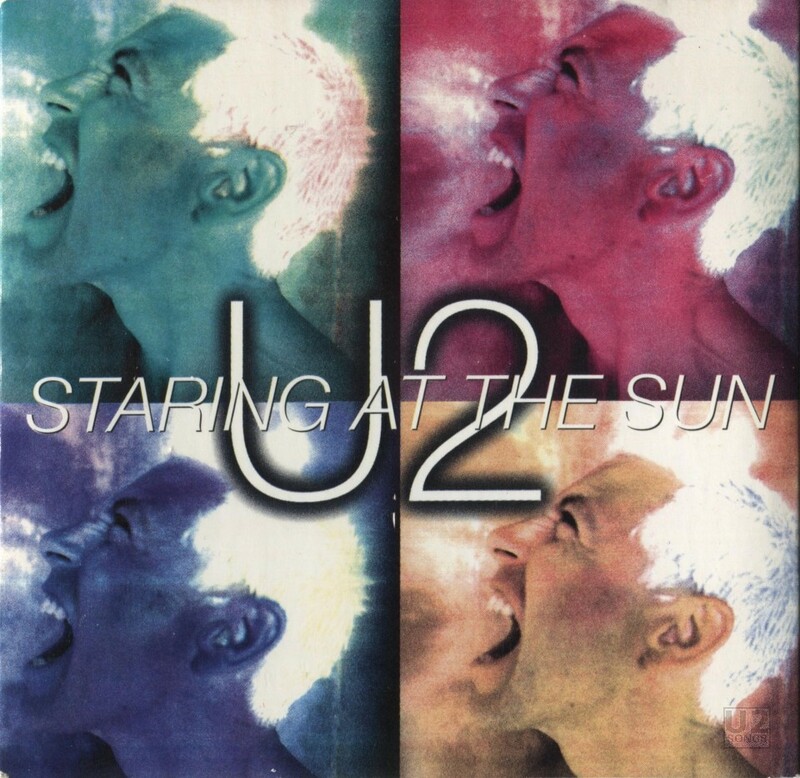 “Staring at the Sun” was the second single from the Pop album. Although originally advertised for an April 7/8 release, it was pushed back a week to April 14/15. Unlike most of the other singles from Pop, there was not a unique “single version” of the song issued. For the 7-inch and two-track CD and cassette releases (all of which featured a four-panel grid on the sleeve with different coloured photos of Adam Clayton’s head), the album version of “Staring at the Sun” was the A-side with a non-album track, “North and South of the River,” as the B-side. Maxi-CD versions of the single came in two formats: a three-track version (with the same four coloured photos on the sleeve) that added the track “Your Blue Room,” and a four-track remix CD (with a single purple photo of Adam on the sleeve) that combined three remixes of “Staring at the Sun” with the same version of “North and South of the River” found on other formats. “Staring at the Sun” was partially inspired by Something Happens, an Irish band popular in the late 80s and early 90s. That group’s second album was called Stuck Together With God’s Glue—a phrase that Bono would later incorporate into the lyrics of “Staring at the Sun.” Released just as The PopMart Tour was kicking off in the spring of 1997, the band would find themselves struggling to perform “Staring at the Sun” during the early dates on that tour. The music press made much of the fact that U2 had launched a massive world tour before they had even learned the new songs, highlighting their struggle to perform the new single in a live setting. Eventually, U2 would abandon the full band performance in concert, favoring a stripped-down version featuring only Bono on vocals and Edge on acoustic guitar. “Your Blue Room” was previously featured on the Original Soundtracks 1 album, a collaboration between U2, Brian Eno and assorted guests and released under the band name Passengers in 1995. “North and South of the River” was first recorded by Christy Moore (who also co-wrote it), with Bono and the Edge on backing vocals. That version was released as a single in Ireland in 1995, and later appeared on the compilation album Celtic Heartbeat 2. In 1996, Christy Moore released his own solo version of the song, without participation from U2, for his album Graffiti Tongue. Finally, in 1997, on this single, U2 would release their own version without Christy Moore’s involvement. The “Sad Bastards Mix” of “Staring at the Sun” was done by Flood and Rob Kirwan, both recognizable from their work on a number of U2 projects in the 1990s. Both the “Monster Truck Mix” and the “Lab Rat Mix” were done by Danny Saber and Butch Vig, under the name “The Sonic Morticians.” Butch Vig is a member of Garbage, a band also signed to Interscope, that would later tour with U2 (during The Elevation Tour in 2001). Two videos for the song were released, the first directed by Jake Scott and filmed in New York. It featured the band performing in dark spaces, and used a series of light effects throughout to create atmosphere. The second video was directed by Morleigh Steinberg and produced by Ned O’Hanlon of Dreamchaser Productions. It included footage shot by Steinberg at various locations around Miami as photo shoots for the Pop album were being completed. Both versions of the video were included on The Best of 1990-2000 DVD, with the Jake Scott version including an optional commentary from the director. “Staring at the Sun” was performed nightly throughout The PopMart Tour in 1997. It was also played at a handful of shows during 2001’s Elevation Tour, sometimes by itself, and others as a snippet added to “Discothèque.” The song was not performed live again until October of 2011, when Bono and the Edge sang it during a concert to honor Bill Clinton’s charitable work. Live recordings of “Staring at the Sun” from July 18, 1997 can be found on the “PopHeart Live EP” and on certain versions of the “Please” single. It was also performed on December 3, 1997 in Mexico City, and released on the Hasta La Vista Baby! fan club album and the PopMart: Live from Mexico City video. The September 1, 2001 performance at Slane Castle, in Dublin, Ireland, can be found on the Go Home: Live from Slane Castle DVD and fan club CD. Music by U2. Lyrics by Bono & The Edge. Produced by Flood. Additional production by Steve Osborne. Recorded by Mark ‘Spike’ Stent and Howie B. Assisted by Rob Kirwan. Mixed by Mark ‘Spike’ Stent and Steve Osbourne. Assisted by Conal Markey and Richard Rainey. Programming: Ben Hillier. Loops: Larry Mullen. Keyboards: Steve Osborne. Remixed by the Sonic Morticians. Produced by Butch “The Embalmer” Vig and Danny “Necrophilliac” Saber. Engineered by John “Carcass Humper” X. Second Engineers: Wes “Grave Robber” Johnson & Jonathan “Grave Digger” Burtner. Remixed at Westlake Studios, Los Angeles. Lyrics by Bono & The Edge. Original recording produced by Flood. Additional production by Steve Osborne. Recorded by Mark ‘Spike’ Stent and Howie B. Assisted by Rob Kirwan. Mixed by Mark ‘Spike’ Stent and Steve Osbourne. Assisted by Conal Markey and Richard Rainey. Programming: Ben Hillier. Loops: Larry Mullen. Keyboards: Steve Osborne. Remixed by Flood and Rob Kirwan. Mixed by Rob Kirwan. Original recording produced by Flood. Lyrics by Bono & The Edge. Additional production by Steve Osborne. Recorded by Mark ‘Spike’ Stent and Howie B. Assisted by Rob Kirwan. Mixed by Mark ‘Spike’ Stent and Steve Osbourne. Assisted by Conal Markey and Richard Rainey. Programming: Ben Hillier. Loops: Larry Mullen. Keyboards: Steve Osborne. Remixed by the Sonic Morticians. Produced by Butch “The Embalmer” Vig and Danny “Necrophilliac” Saber. Engineered by John “Carcass Humper” X. Second Engineers: Wes “Grave Robber” Johnson & Jonathan “Grave Digger” Burtner. Remixed at Westlake Studios, Los Angeles. Original recording produced by Flood. Lyrics by Bono & The Edge. Additional production by Steve Osborne. Recorded by Mark ‘Spike’ Stent and Howie B. Assisted by Rob Kirwan. Mixed by Mark ‘Spike’ Stent and Steve Osbourne. Assisted by Conal Markey and Richard Rainey. Programming: Ben Hillier. Loops: Larry Mullen. Keyboards: Steve Osborne. Music and lyrics by U2 and Brian Eno (Passengers). Produced by U2 and Brian Eno. Recorded by Danton Supple. Assisted by Rob Kirwan. Photography by Stéphane Sednaoui. Design and computer treatments by ABA Dublin.